A Starlight Reserve is a site where a commitment to defend the night sky quality and the access to starlight has been established. Its main function will be to preserve the quality of the night sky and its associated values, being them cultural, scientific, astronomical, natural, or landscape-related. A Starlight Reserve will have a core or dark zone. This is an unpolluted area where natural night sky light conditions are kept intact. This core zone will be protected by a buffer or protection zone to avoid the adverse effects of air and light pollution reaching the core zone. Finally, an external zone where criteria of intelligent and responsible lighting will be enforced, protecting night sky quality from other harmful factors such as air pollution. 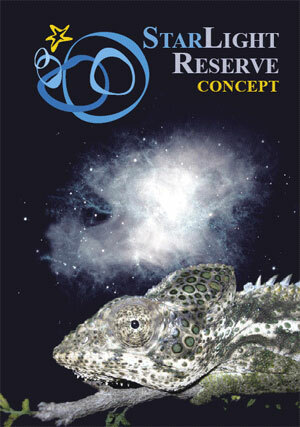 Each Starlight Reserve requirements would be specific to the characteristics, singularities and functions of the site, which should be related to the preservation of the quality of astronomical observations, wildlife conservation, together with the maintenance of the integrity of nighttime landscapes and cultural heritage scenarios. A Starlight Reserve declaration will be accompanied by a participative action plan and an ensemble of recommendations aimed to preserve and recover the night sky quality up to the feasible limits, paying attention to the related cultural, educational, scientific and environmental benefits. The objectives and functions of Starlight Reserves are guided by the principles contained in the Declaration in Defence of the Night Sky and the Right to Starlight. The Starlight Reserve concept goes further than the mere protection of the astronomical quality of night sky, approaching other dimensions. It aims recovering and protecting the existing values related to the contemplation of the firmament, with a special emphasis on the importance of the associated cultural heritage, both tangible and intangible, besides astronomical observation. The Starlight Reserve concept also includes the nature dimension, that is the importance of clear night skies for landscapes, wildlife species and biodiversity conservation at night. It is therefore applicable to many different situations such as protected nature areas, biosphere reserves, world heritage sites, nocturnal skyscapes, areas surrounding astronomical observatories, cultural heritage sites, rural and urban oases, and also “starlight tourist destinations”. The proposal to develop a “Starlight Reserve” concept was one of the additional recommendations to the Starlight Declaration, to be carried out with the support of the organizations (UNESCO, IAU, IAC, UNWTO, CMS, MaB,…) which promoted the Declaration and the Starlight Scientific Committee, in cooperation with UNESCO’s World Heritage Centre through its thematic initiative “Astronomy and World Heritage”.